This hand-thrown, stoneware vase decorated with thick, polychrome glazes depicting daffodils and leaves, is an extremely rare and important example of Dedham Pottery. It is signed by Hugh C. Robertson and was made between 1896 and 1908. 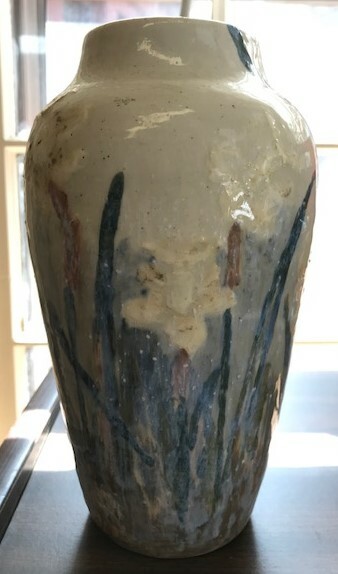 The multi-colored, representational floral decoration on this vase departs significantly from Robertson’s more typical abstract glazed imagery, and is one of only a very few known examples of his work in these glazes showing flowers. An example with tulip decor is currently on display at The Metropolitan Museum of Art in New York City as part of the Robert A. Ellison Jr. collection. 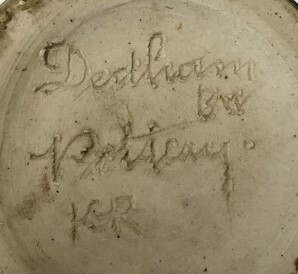 The DHSM vase may be the only Dedham Pottery example with three-dimensional floral imagery. The gift was made in memory of Edward W. & Helen A. Vogel. Family history relates that the Mr. Vogel’s grandparents lived near Dedham Pottery (now Potter’s Lane where the new Ames School is located) and during The Great Depression, his grandmother would bring home-cooked meals to the hungry workers as they sat outside during lunch time. 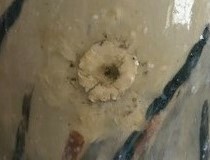 In appreciation of her good will, Mr. Robertson (probably Joseph Milton Robertson, grandson of Hugh Robertson, who ran the pottery from 1929-1943), gave her this vase, which was made by Hugh between 1896 and 1908. It remained in the family since that time.